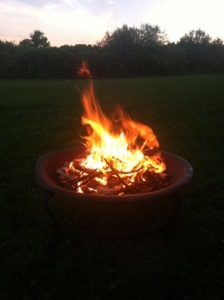 Instead of fireworks, we had a bonfire in the backyard. We did use a few sparklers which delighted my daughter. Plenty of sparkles without all the noise. She made an offering of birdseed to the Nature Spirits. I made offerings of drink to the Ancestors and Gods. I sprinkled juniper berries into the fire for Brighid. 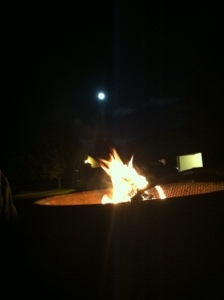 It was a simple but lovely night. Bee shows a greater interest in what I do, and she loves to honor nature outside and inside at her nature table / play altar. 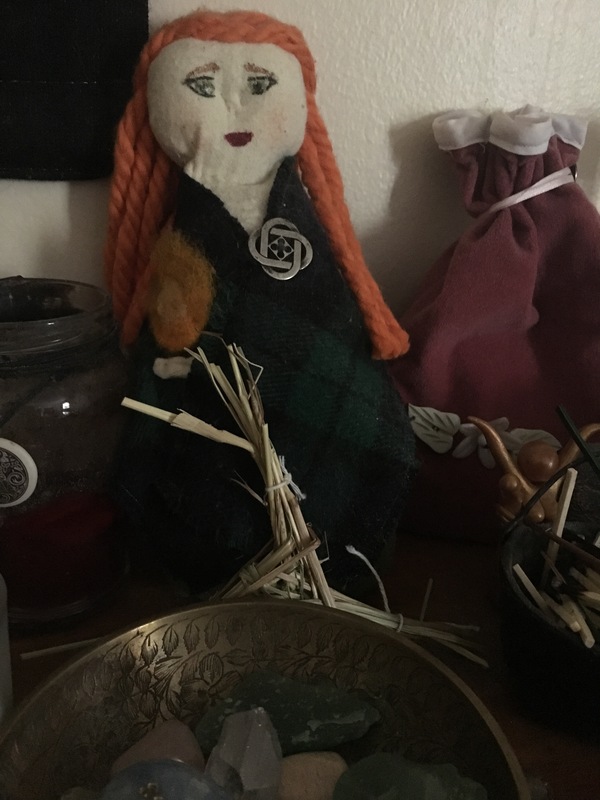 The one thing she was missing was a representation of fire – one of the Three Hallows in my Druidic tradition, and an important part of any Celtic spirituality. 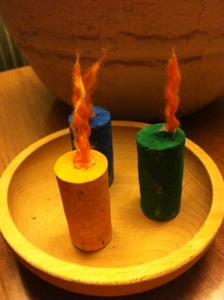 I’ve thought about different ways to create an appropriate representation, and when I thought of this Imbolc activity, I realized that it was exactly what she was missing! Furthermore, it’s a great way to reuse old wine corks! 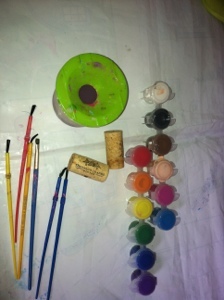 Equipped with an apron and seated on our large splash mat, Bee was able to paint her cork. My husband and I joined her to paint two others, making this a fun family activity. I let her choose her color – orange! How firery. Because we used washable paint, it was very thin. We had to let the corks dry between a couple coats, and we had to put the paint on rather thick. That’s ok, though, as it looks like wax dripping down the sides of the candles! I’m thinking about sealing them with a glaze later on. Once the corks dried, I cut orange and yellow yarn into very short lengths – about an inch, but I could have gone smaller. I separated the fibers to give the an airy look, then twisted them together loosely. Pinch the bottoms tightly and roll them between your fingers to join the fibers. Put a dot of hot glue into the corkscrew hole. Using a dull tapestry needle (or other similar object), push the bottom of the fibers into the hole and glue. Voilà! Flaming candles! I’ve been really curious about rocket stoves. I see people interested in sustainability, survival skills, and camping post about them from time to time. Turns out, my father has been interested too. He’s more mechanically-minded than I am, so he made one using BPA-free cans (supplied by yours truly). I also helped him by gathering fuel on my most recent nature walk. 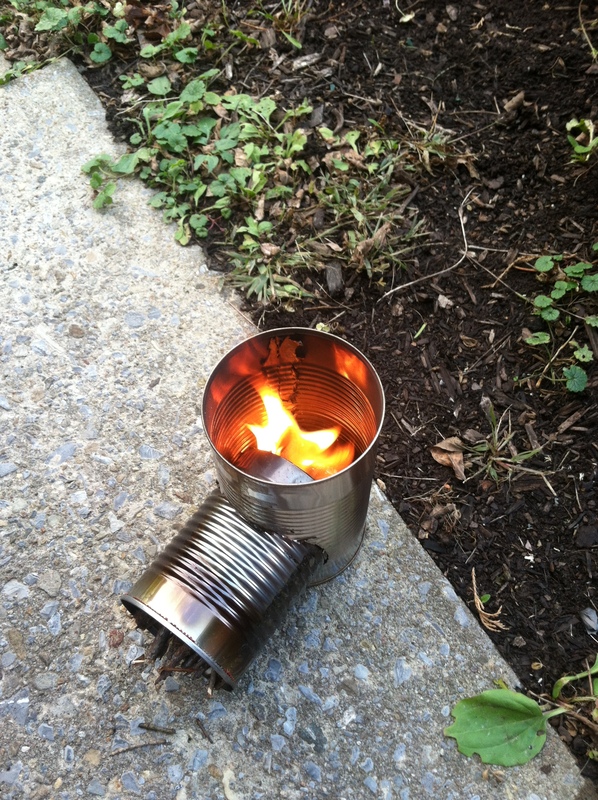 He finally tried it and, for just a tiny test stove, it was really impressive! Before I got my camera out, the flames were quite large. My father feels confident that he could have boiled water with that. I might not have a proper fire pit, but perhaps a little rocket stove could get the job done if I ever wanted a flame large enough to make offerings into. Have you explored rocket stoves?